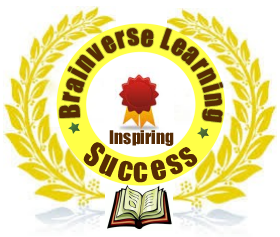 Thank you for your interest in knowing more about Brainverse Learning. Learning by example is one of the most effective ways of instilling enthusiasm in learners and even employees. When success is re-cultivated by people who have succeeded into people who success is expected from, a lot of potential is built in each and every learner. I thought of these fact and asked myself of a way to bring such stories of success closer to the people who need them. I thought of a way to reach the people from whom success is expected. I could not find any other way better than this. To form a small organisation that would help gather information and success stories from various professionals and succeeded employers, post it online for people to get the acumen to follow their footsteps and find their way to success. The thought that led to the formation of this student based body was the feeling that the saying of "Hard work leads to success" was just not enough to make someone succeed. Usually one may try to work hard in whatever means but never gets enough motivation a midst the several failures many times these same people try to convince themselves to quit their dreams. We have a firm belief that something seen and witnessed brings more appeal and understanding than something told. We realized the need for moral motivation in the shaping of success and its contribution to the realization of successful stature. Something came into our minds, something that could not be easily erased. Many girls and boys quit education not because they are unable to learn and get good results but because they have no proper mentorship and attach no importance to education and success. This takes place in lower education levels, high school levels and even in tertiary learning institutions. We are taking it upon ourselves to let the good news of success and acumen acquisition and the manifestation of prosperity among the young generation. We are here to get the information from all those fellows who have made it in life, ask them to share the knowledge with the young generation who are wallowing in disbelief and uncertainty of their fates. We bring this information to our audience to help build the right strength to go through their endeavors with bravery and take every stumbling block as a stepping stone, knowing that someone else had done it, so can they. We have three different levels of audience that we are targeting: Primary School audience(2- 17 years); High School audience( 18- 24 Years) and Tertiary learning institutions audience (24+ years). We have a work scheme to access these three groups effectively and in the most appropriate manner. We are basing majorly on the internet and the social media through blogging and getting the information reach the furthest of distance. We have also put up strategies that will enable us to partner with different institutions to enable us invite our clients to talk to the students in every possible institution. We are also on our way looking for partnership with various organisations in our country so as so join hands together in enlightening a student and make them torch bearers, to make them have an experience to talk about one day when they are swimming in a pool of their sweat, harvesting from their works and blessing the mouths from which they hears the good news, praising the pages from which they read the good news, and reciprocating the same. Thank you so much for taking your time to read about us. We believe that you will be able to extend a hand to help us venture in our mission We value up to a single word from us that you will tell the next person. Cell: +254 713 396 827.